…and we’re still getting used to each other. He’s not a youngster, he’s been through a lot of changes, and he’s not 100% comfortable with me. In fact – ironically, given where Ghost ended up living – he has made it very clear that if anybody cares about his opinion he’d much rather move in with that nice lady in the big house. Yes, he fell in love with Former Weekender Neighbor L. I assume that’s because she reminds him of ML, with whom he lived most of his life. Yeah, I took it a little personally. Which is not that we’re having any serious personality clashes. He’s a sweetheart, genuinely pleasant to be around. If I have one real complaint it’s that outdoors he’s such an idiot. It’s easy to believe he spent his whole life in a house or a fenced yard, because he doesn’t know anything – even “sit” is a mystery to him. He doesn’t have the brain God gave a butterfly: Compared to him Little Bear was a paragon of focus. He will very cheerfully chase any wasp that flits past his nose, as often as not directly into that Prickly Pear he remains utterly unaware of as he miraculously escapes injury once again. I’m still waiting for our first snake encounter, hoping very much it’s a bull snake in case it happens while I don’t have my eye directly on him. He’s nowhere near coming off the leash. His attitude toward me isn’t unfriendly, but still quite guarded. I don’t get many glimpses of that famous Corgi grin. He insists on getting his head nerfed first thing in the morning, but I think he believes that’s a life necessity and I’m just the only one around with hands. But we do seem to be making progress. Yesterday evening we had what I took to be our first really direct communication. It was naturally enough a dialogue on the vital importance of dog biscuits. Yeah, he’s addicted to biscuits and convinced that every expedition outdoors must end with one. Late in the afternoon we went out to the wash for a pee. He came back in, got his biscuit, and then decided that it was dinnertime. He has this generic “hey, I need your attention” thing that leaves it up to me to figure out the problem. On this occasion I correctly guessed (based mostly on the time) that he wanted dinner, fed him, and then decided another walkie was probably wise given things I’ve noticed about his bowel habits. So on went the leash again and out we went to see if somebody needed a poop. This was two walkies within fifteen minutes, and I didn’t figure two biscuits in the same period were required. Laddie disagreed so strongly that he really focused on communicating with me for the first time. 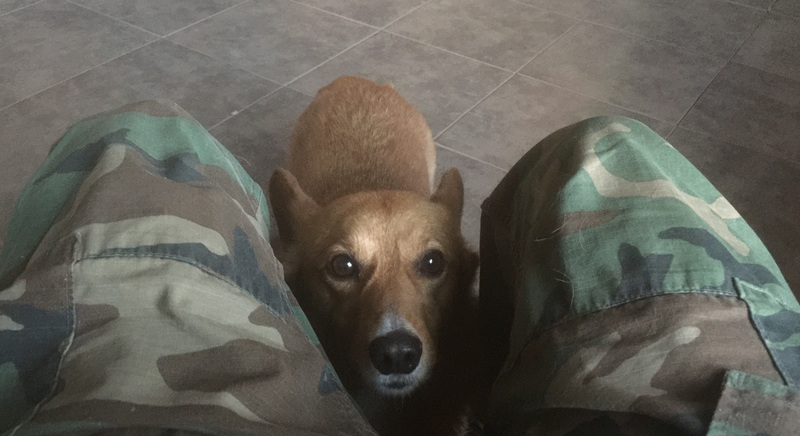 I hung up the leash and sat down in the bedroom; he immediately recognized my error, dashed into the room, danced around my legs until he had my attention, then ran to the bedroom door aimed at the main room and looked back at me, gave me that big Corgi grin, tail stump wagging furiously. When I got up he ran into the main room and straight to the little tub where I keep the biscuits. Couldn’t have been clearer if he could talk. That’s the most direct conversation we’ve ever had. So we’re getting there. I still miss LB and can’t help making with the invidious comparisons sometimes – LB was also a massive black hole of stupid but he was my idiot and we understood each other, and at least he knew the basic rules of outdoor survival. Sometimes I think it was too soon for me to be taking on another dog, especially one that’s been through three homes in three months and is not having a really easy time. But Laddie is pleasant and quiet and mostly undemanding: The frustrations all come from neither of us automatically knowing what the other expects. That will come with routine, I suppose. Maybe it is the camera angle, but yon Corgi looks a bit chunkier than he did when he arrived? You may have to be more judicious with the treats or use tiny ones like we do for our 19 lb westie. One inch square or mini dog bone shaped. Big ones like LB would scarf are not a good idea. Hey, he was chunky when he got here. And I was think he had slimmed up a little. That will definitely take some adjustment, which may or may not happen. We were gifted with our Chiweenie when she was 6 months old and we were her 4th family. Like Laddie, she was never abused and there were totally legit reasons why people couldn’t keep her. But now, at 8 1/2 years old, she still has real issues with separation and abandonment. So, at least you can be glad that Laddie is adjusting mostly and doesn’t have strong life long issues. In my very limited experience dogs seem to have a bit of a struggle going from a female to male home. We tend to be bigger, deeper voiced and less demonstrative. I’ve seen this with some adopted dogs; they tend to regard the human(s) as “food dish filler of the month” and take quite a bit of time to accept conditions as “normal.” Some never make the complete transition from temp to perm. Yeah, I went through that with Ghost for eight years – we lived together peacefully enough but he seldom especially warmed up to me. The thought of doing that for another eight with Laddie, especially if he spends the whole time trying to work up a love triangle with one of my favorite neighbors, isn’t as heartwarming as he might imagine. Hell, Joel, at least they ain’t cats. I have 3 (1 outside, 2 in-and-out), and they drive me to distraction trying to figure out what they want. Especially since one is part Siamese, and they’re like redheaded women–all Siamese are psychotic. They may not show it at first, but give ’em time. Of course, when I tire of the game, which comes sooner as I age, I just ignore them. I’m bigger, armed, and I have thumbs (and headphones). They’ll dine on my carcass when I croak, in revenge, but I figure that’s only fair. Oh, you can believe that I’ve learned my lesson about who gets the good water.